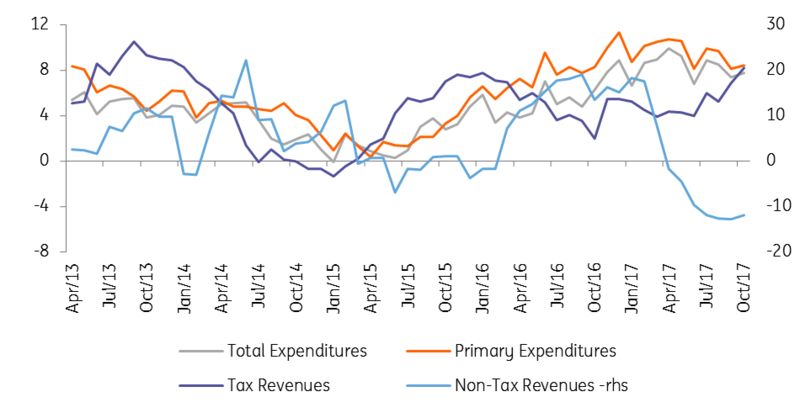 The October budget saw the government's revenues increase by 21.8% year-on-year, while primary expenditures accelerated by 29.8% YoY expansion following unexpected contraction a month ago. We also saw a sharp 22% YoY jump in interest expense due to the uneven repayment schedule of the Treasury and elevated rates since the beginning of this year. Accordingly, the primary surplus in October 2016 of TRY2.8bn melted to a barely positive reading of TRY0.2bn, showing the extent of the deterioration in monthly performance. On a monthly basis, robust revenue growth is driven by a jump in tax revenues of 26.3% YoY, stemming from income tax (5.6ppt contribution) and SCT receipts (4.3 percentage points), while VAT on imports provided a 7.5ppt contribution given recent acceleration in imports, robust domestic demand and the boosting effect of TRY depreciation. The data also includes the impact of collections sourced by the tax amnesty regulation, amounting to TRY25.5bn on a cumulative basis this year, while non-tax income has remained weak. On the spending side, the expansion in primary spending is significant, driven by almost all items. 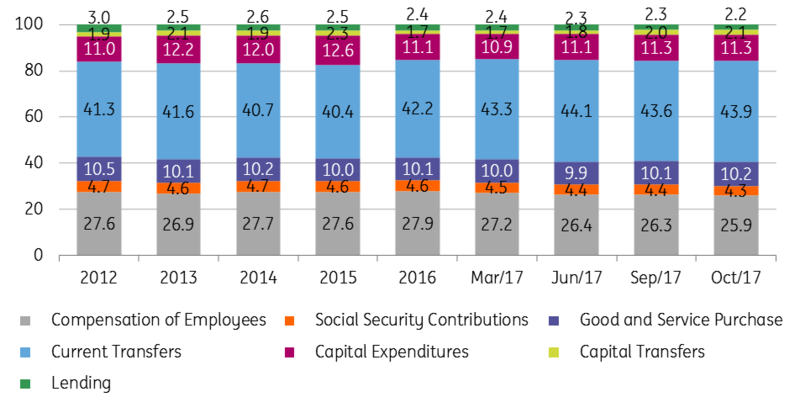 Current transfers, due to health, retirement & social aid expenditures as well as local governments' revenue shares was the major driver, recording a 37.1% YoY increase. Following a benign September reading, we see another bout of widening in the deficit in October despite reversal of most of the stimulus measures to support economic activity at end of the third quarter. However, according to the Ministry of Finance, the latest budget developments are incompatible with the Medium-Term Programme (MTP) and the target at 2.0% of GDP for this year is still within reach.